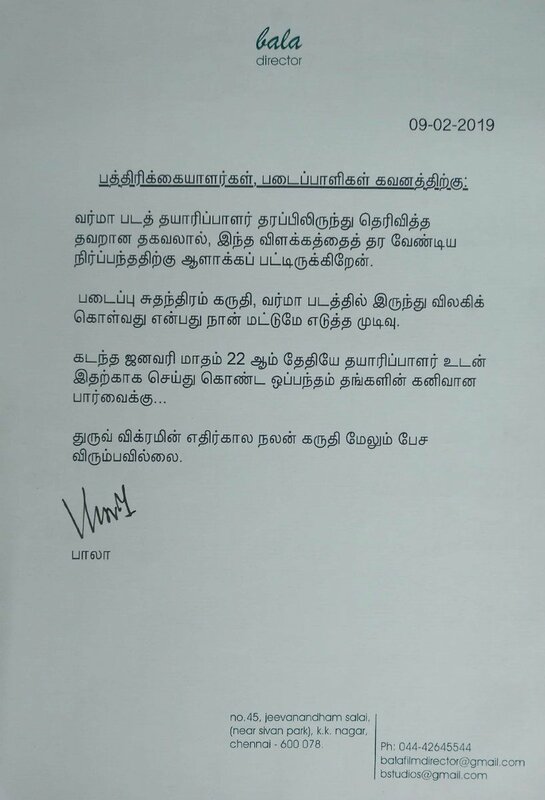 SHOCKING STATEMENT From Bala Regarding “VARMAA” Drop Issue !! For The First Time Bala Opens !! 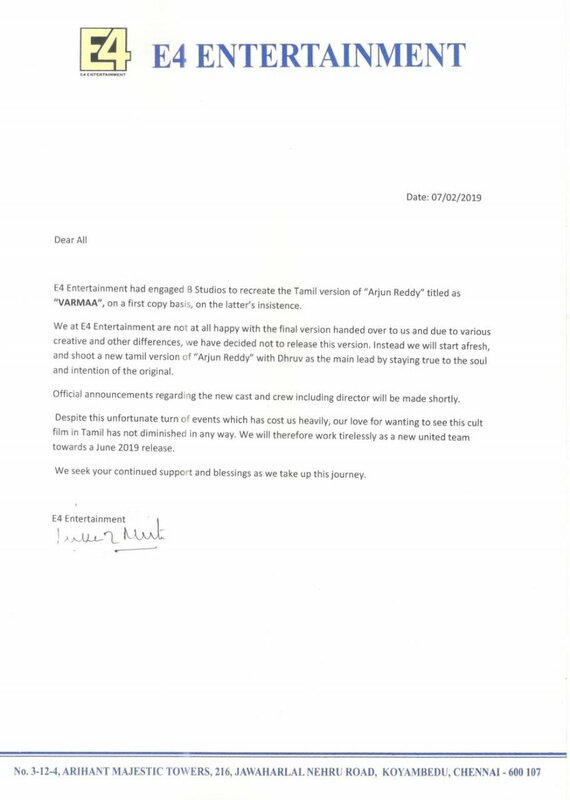 Following the bombshell press release from the E4 Entertainment who produced the film “Varma”, now the director has released a press release which even more shocking. In his press release Bala said that he is the one who initially said that he is relieving from the project not the other way around. 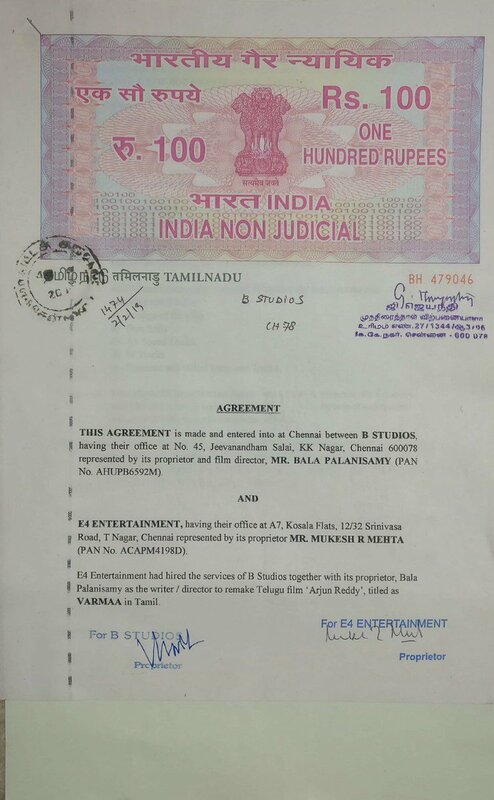 In his press release Bala said “” I’m forced to release this explanation due to the false statement from the producer of ‘Varmaa’ In order to safeguard creative freedom, it was my own decision to relieve myself from the project. 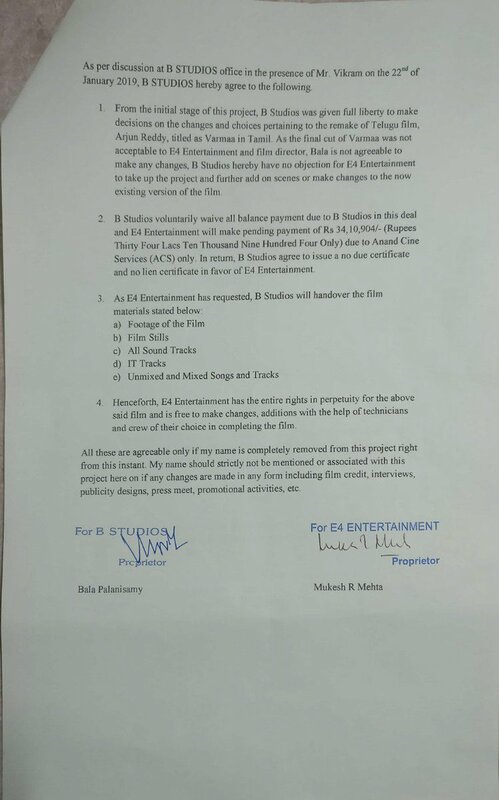 Please find the agreement initiated by me and the producer on Jan 22, 2019, along with this. The Tamil teaser of the much-anticipated film Varma was unveiled on September 23. While Dhruv reprises the role of Vijay Deverakonda, Megha chosen to do Shalini Pandey’s role in the Tamil remake. This is first time in Tamil cinema ever to happen. We have seen Kamal Haasan’s Maruthanayagam dropped due to the lack of budget and Selvaraghavan’s many projects shelved due to various reasons but planning to make a whole new movie again which is already completed is first of its kind controversy that Tamil audience witnessing. According to some news websites, the production house doing talks with filmmakers such as Gautham menon and Alphonse Puthren to re-shoot the movie where as late ace actress Sri Devi’s daughter Jahnvi Kapoor is in talks to do the female lead role. I don’t know wht made Bala took this serious.there s no creativity of his involved.its just remake of the original created by some one. What do you think on this press release of Bala ? Comment below !! Previous articleTeen Girl Gang Raped Infront Of Father !! Police Arrested 4 Of The Accused !! Next articleIruthi Suttru Fame Ritika Brutally Trolled Arjun Reddy Shalini Pandey !! JUST HILARIOUS ! !